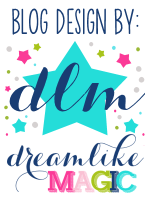 Please welcome Lidia Barbosa with her first guest post at Mrs. Miner's Monkey Business. Enjoy! 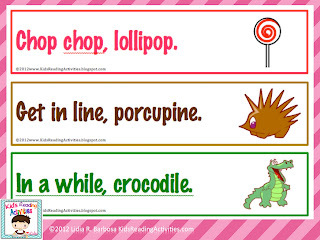 Rhyming skills can be a little difficult to develop in young learners. 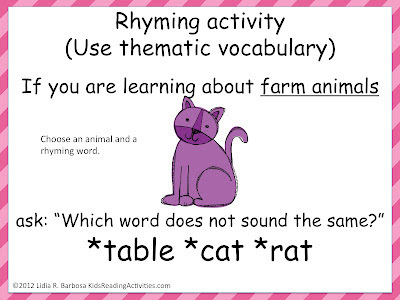 We need to provide plenty of opportunities where students will hear and practice rhymes. 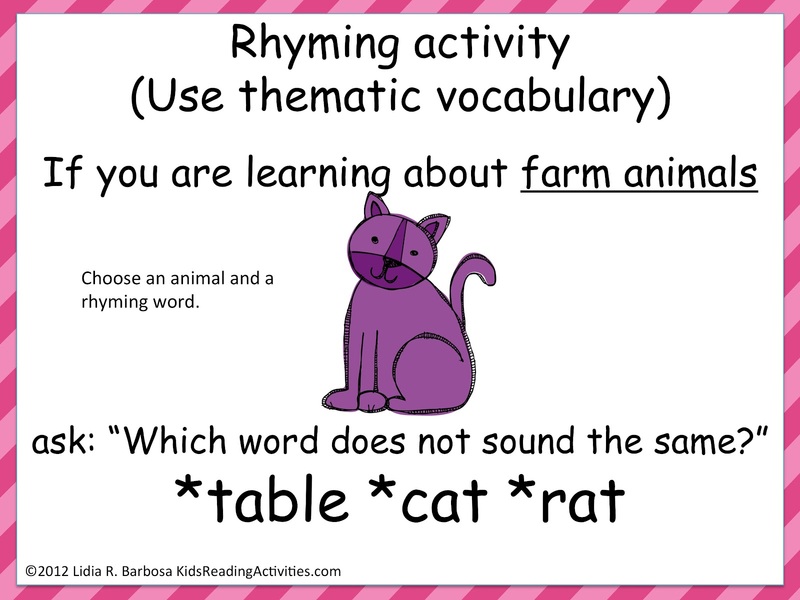 Rhymes are important in developing phonemic awareness. They tend to be short, repetitive and help you hear patterns in words. 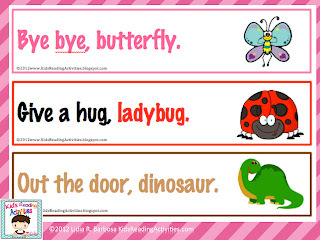 Children develop language skills and vocabulary through rhymes as well. 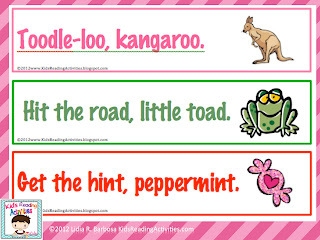 Nursery rhymes introduce silly, playful words that might not be heard in every day conversation. 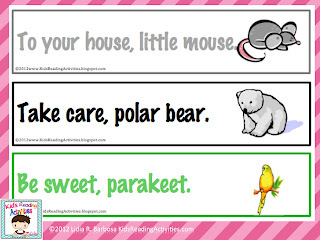 These rhymes help kids paint pictures in their minds which in turn, helps with dramatic play. You can begin introducing rhymes with different games, songs and chants. It is good to try activities that are auditory and visual to help listen for patterns in words and identify similarities in written words. 1) Concentration games: Students use picture/word cards to find the rhyming pairs. Remind them to say the words and listen for the ending sounds. 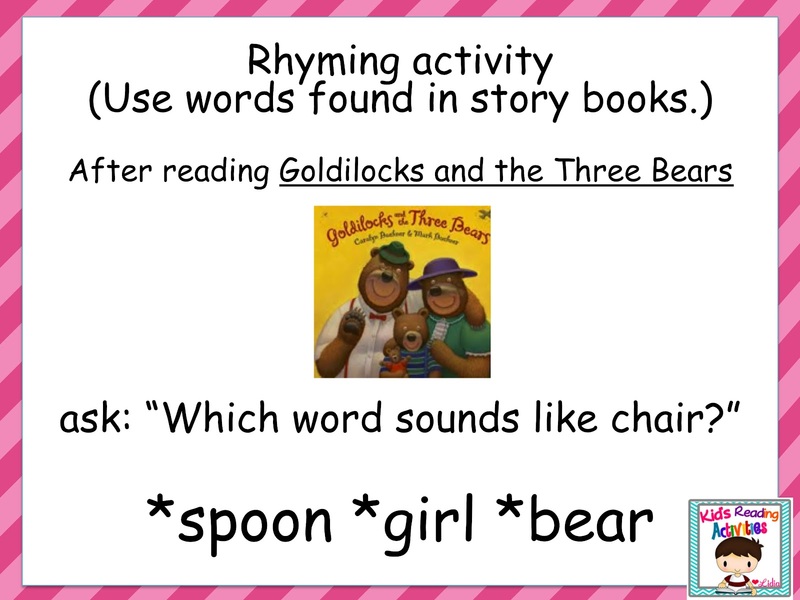 2) Pocket chart activity: Students match rhyming picture/word cards. 3) The teacher can introduce a word family. Students will write the word family on a dry-erase board. Then, they will make a list of words that rhyme by changing the first letter in the word. This list of words can then be sorted and recorded as real or non-sense words. 1) Which word sounds the same? 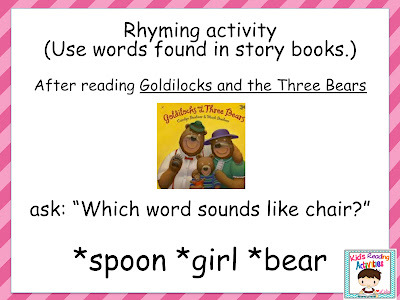 -You can incorporate rhyming practice during your read alouds. Choose words from the story books. Many stories already have words that you can pair together. In this example, I used three words to choose from. If your students are having difficulty naming the correct word, simply reduce the amount of choices. 2) Which word does not belong? -You can continue to make learning fun and relevant by using vocabulary words from your current theme. You just have to choose a word from your thematic word bank, include a rhyming word and a non-rhyming word. Then, ask children, "Which word does NOT belong?" 3) Read a poem or sing a song with rhymes. 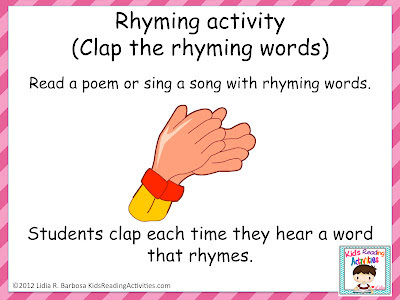 Students can clap or stand when they hear a a rhyming word. This is a free dismissal chant that will get your students thinking about rhymes every day before going home. My son loves it! Click on the picture to download your free printable. 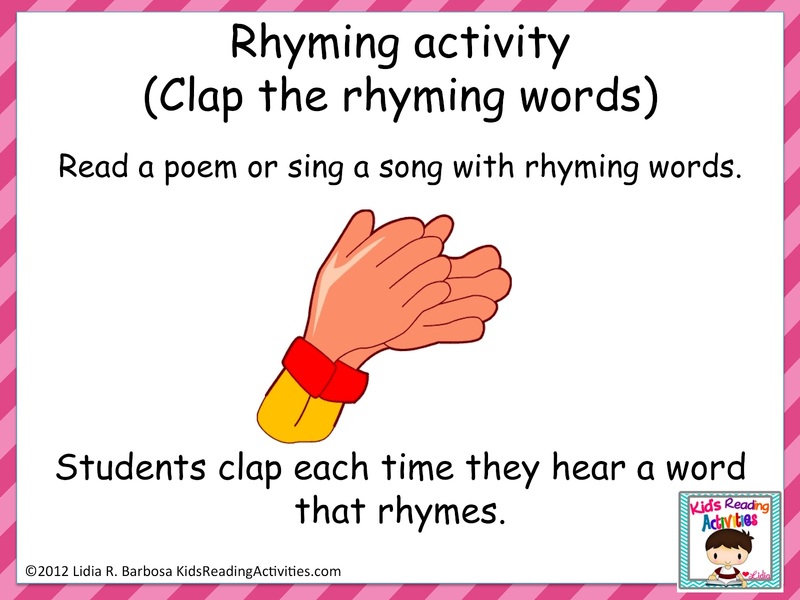 Depending on your student's ability, you can post all of the rhymes and recite the entire chant or choose about three rhymes per week. I hope that I have given you new ideas for practicing rhymes with your little ones. Enjoy your rhyming freebie! 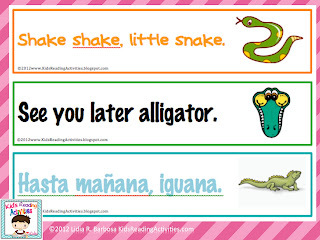 Lidia is the author of Kid's Reading Activities and Kinder Latino. She has taught Pre-K, Kindergarten and Second grade. Lidia loves creating activities in English and Spanish.